Well, we're back from our week-long stay near the Pinery Provincial Park! There's nothing like their dog beach! (I'll put some pictures up here.) But, as regards our tour, I was able to put out some advertising. There's a restaurant/gas station on Hwy 21 that now has our bookmarks and, most importantly, the Lambton Heritage Museum, right across from the Pinery, has our pamphlets, along with the Elora Hallowe'en Scare Fair postcards and April Norton's Oct. 14 Doll & Teddy Bear Show in London. At the campground where we rented our cabin, they had a Hallowe'en weekend which sadly was rather half-hearted... but I thought what a great opportunity to advertise! 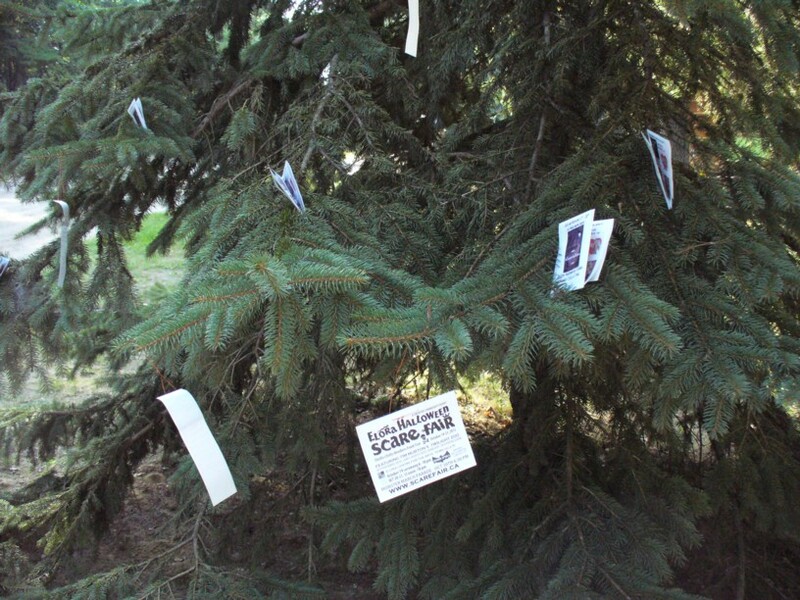 So the morning everyone was to decorate (only 4 campers did) I hung out our bookmarks and pamphlets and Elora's Scare Fair postcards in the trees surrounding our cabin. (String? Mom cut apart a firewood sack and we used the orange fibers!) When we came back from the beach, they were all gone!!! The managers felt it was "too distracting"... okay, then all decorations would be distracting, now, wouldn't they? Anyway, they said we could hang 2 or 3 but no more. I hope bats poop on these rather hypocritical individuals. Anyway, on 3 nights we enjoyed bat-gazing while they swooped and dove to catch their dinners. They are just so neat to watch!